Should we go to the ER? Can it wait until Monday? Is it broken? Download our app—OIP CONNECT—today, and have these answers in your pocket! 24/7 Orthopedic Advice Get the emergency orthopedic advice you need at precisely the moment you need it. One tap access via our 855-OUCH-OIP (855-682-4647) 24/7 Orthopedic Advice Hotline. Orthopedic Urgent Care Walk-ins accepted at our Camp Hill and Harrisburg offices – Learn more. 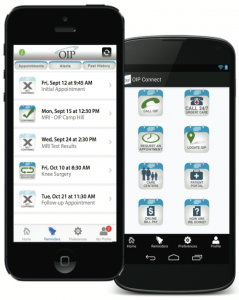 Request an Appointment OIP Connect also makes requesting and managing appointments easy. OIP Connect automatically enters your appointments right into your personal calendar. Confirm your appointment, request a change to your appointment, or contact the office with a tap of a button. Locate OIP & Arlington Orthopedics Locate the nearest OIP or Arlington Orthopedics office, have directions loaded in Maps. What could be more convenient? Request an MRI OIP and Arlington Orthopedics offer the lowest cost MRIs available in our region. Contact us today at 717-901-1234 to learn more about our total body scans. Patient Portal Communicate with our office on your time via our secure patient portal. Request an Appointment, Request Medication Refills, or communicate with your provider via direct messaging. How are we doing? Provide us with feedback regarding your visit today so that we can continue to create an amazingly, positive, memorable experience. Referring Provider Portal This is how your medical care team can communicate with us. For All of Your Orthopedic Needs! Getting OIP Connect on your Apple or Android device is easy, fast and free. Simply visit the Apple App Store or the Google Play Store, search for OIP Connect and download. In just a few moments you can have access to everything OIP, from learning about our practice to what to do when you break your wrist to scheduling a follow-up appointment. You won’t ever forget your appointment or wonder what to do when a healing injury suddenly starts hurting more. Plus, your information stays completely confidential. At the Orthopedic Institute of Pennsylvania, we help our patients feel stronger and live healthier lifestyles. We’re dedicated to providing a convenient, interactive patient experience that assures you have access to the quality care you need, when you need it. Download OIP Connect today and keep growing stronger. *OIP Connect is available on the App Store & Google Play as a free download.